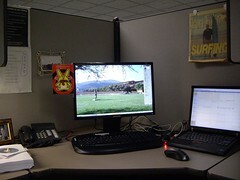 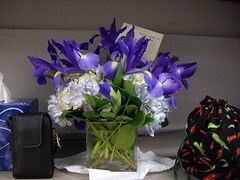 So to start everything off, I present a shot of my cubicle and the flowers that DH sent to the office. I did not want him doing such things anymore because it was starting to get embarrassing at The Corporation. However he did well by being discreet and the little vase is now where I keep my personal phone, wallet, keys — whatever I need for it to do.